Spicy Black-Eyed Peas A Delicious Bit of Luck! This is a delicious thick meal full of flavor and spices! Even if you don’t care for black-eyed peas you just might like this dish. Plus it’s healthy, quick and inexpensive… a combo I tend to love! The day we first tested this out was New Years day. We gathered the ingredients and they were on the stove. Then things got a little odd… While the peas were simmering our good friend Kee Kee called and said she was in town with a friend of hers and wondered if we wanted to go out to dinner with them. There was only one stipulation: we had to find a place that had black-eyed peas so she could eat some for luck for the year. (Evidently that’s an old Southern tradition.) Roy told them to just come on over to our place as we were cooking up a batch at that very moment. True story. For a bit more luck added to your home make a lucky horseshoe decor. And if you’re looking for some other ways to start the New Year off right check out our Unique New Year Resolution Ideas Kit! IMPORTANT: Liquid Smoke is a KEY ingredient to this recipe’s wonderful flavor. Don’t leave it out! Hi! These beans were absolutely PHENOMENAL! I had never had black-eyed peas before, so I was definitely worried about finding the right recipe for my first try, and yours was the one! I didn’t have any liquid smoke or hot sauce, so I added chili powder and paprika! With what was leftover I made stuffed sweet peppers with quinoa! ABSOLUTELY DELICIOUS! Just wanted to let you know personally how GREAT I thought your recipe was!! Thanks Karen. I’m so glad you liked them! 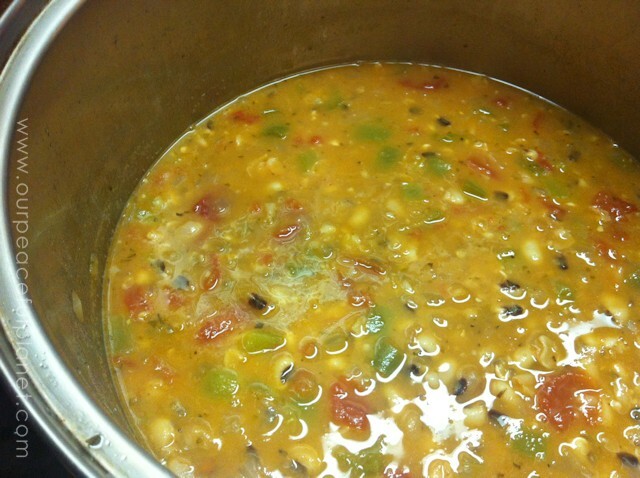 Thanks for the share and also for your delicious looking recipe! Hi – so, you simmer the dry peas in the stew, right? You don’t cook the peas and then add them to the rest of the ingredients. Peas and water go into the rest of the pot and you cook until the peas are done. Thanks! That’s essentially correct but the peas have been soaked first overnight. So they are not dry, just not cooked. Ü Thanks Stacy! Hope you enjoy the recipe. I’m no fan of black-eyed peas but I LOVE this dish. Can you make this recipe using pre-cooked black eyed peas from a can? Hi Alex! I would imaging you could and just not simmer very long. Not sure how that would turn out though. The simmering does cook in all the flavors though so I’m not sure how to tell you to do that. I’d just do a test run and see how it goes! This was wonderful and made enough for leftovers. I like the whole, ‘cook once, eat twice’ idea so I look for large pots of things. The only change I made was to use carrots in place of the green pepper. Hi! I just wanted to ask, what is the brand of the hot sauce for the beans? Hello Lidia! We use Tabasco. I’ll add to into the post. Thanks so much for visiting! How high of heat should I cook the peas on? Do I need to cover them while they cook? Hi Natalie! What we do is cover the peas with 1: to 1 1/2″ water. Place them over high head until they boil then turn it to low and cover them, allowing to simmer. You’ll want to check them about every 15 to 20 minutes and stir when you do. They take anywhere from 45 minutes to 2 hours depending on the peas. Make sure to check the instructions on the bag of peas but most should be similar I would think. Good luck! Super-delicious looking and nice to find a vegetarian recipe for black-eyed peas! Will be trying this out on New Year’s Day! Thanks Elizabeth! 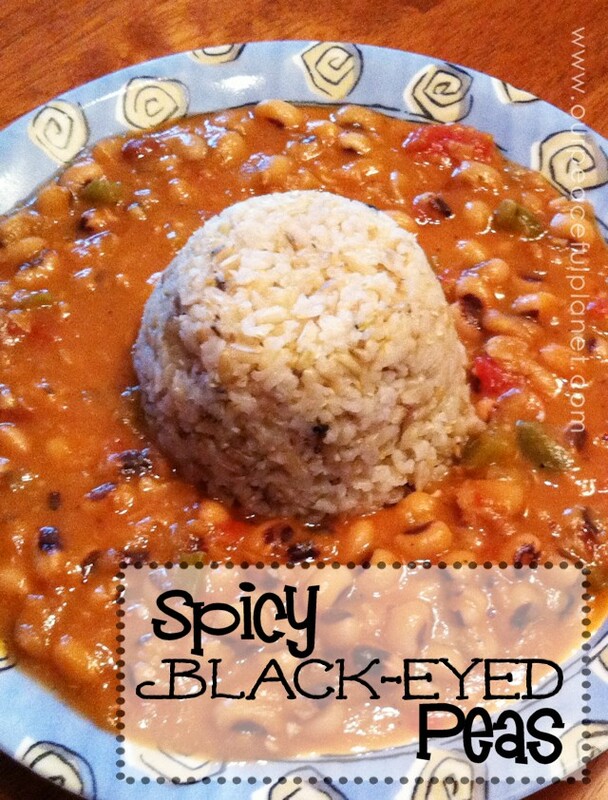 I was never a black-eyed pea fan but these are delicious! Yes! They were a hit! The only change I made was using a tablespoon of apple cider vineagr & half a teaspoon of red pepper flakes, only because we didn’t have hot sauce in the house. Everyone loved them, and we’ll be using the recipe for years to come. Thank you! So glad to hear that Elizabeth! Thanks so much for letting me know!